You will enjoy touring this well-preserved tower house. Its secluded setting and unusual features make it fun to explore. You find the castle by walking from the car park along a stream and over a natural rock bridge. The field to the right of the gatehouse once contained castle buildings which fell when the land beneath collapsed into the underground river. 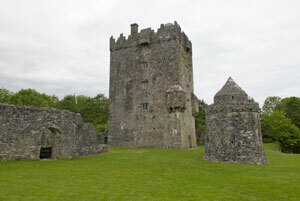 Most of the outer walls and small towers that protected Aughnanure Castle have been restored. 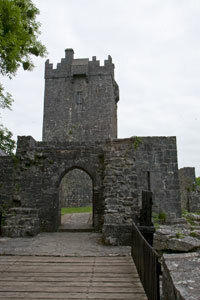 A small round tower that was part of the inner protective walls still stands, but is not open for viewing. 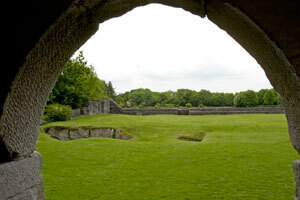 You will see the remains of a banqueting hall to the right in the castle yard. When you go through the door, you will notice the beautiful carvings around the windows. 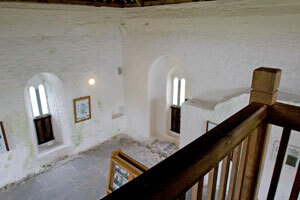 The tower has six stories and an extension on each floor where more small chambers exist next to the stairway. 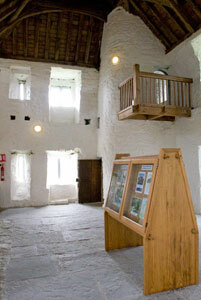 The small chamber over the first floor has a "murder hole" over the main entrance from which intruders could be attacked. The third floor is a living area with a fireplace. The fourth floor has a sleeping area and a secret vault. The fifth floor is a large hall with another fireplace. The vaulted basement includes a display telling you that many bats make their home in the castle. Some enthusiasts even hold early morning bat watches. Don't worry; you won't see any of the creatures here during the day! The O'Flahertys built Aughnanure in about 1500. 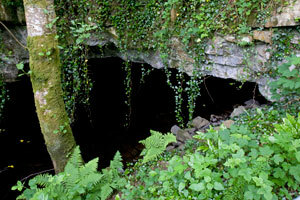 The O'Flahertys were one of the main native dynasties in this region of Ireland. The famous "Pirate Queen", Grace O'Malley, married into this family in the mid-1500s. "Murrough of the Battleaxes" O'Flaherty won a battle near Galway against the English in the mid-1500s and was later pardoned by Queen Elizabeth and made ruler of this part of Ireland. He helped the English capture Aughnanure from other O'Flaherty clan members and was "given" the castle by the English rulers. He then made the castle into his residence. In the 19th century, a member of the O'Flaherty clan planted yew trees near the castle in honor of the castle's Gaelic name, which means The Field of the Yews. 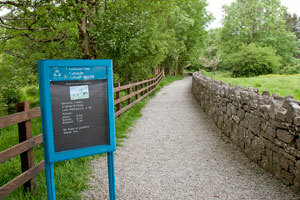 To visit the castle, follow the signs from N59 between Galway and Oughterard. 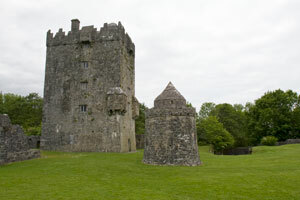 The Office of Public Works manages the Heritage Sites in Ireland, including this castle. You can check the opening times and other details at their website (opens in a new window).